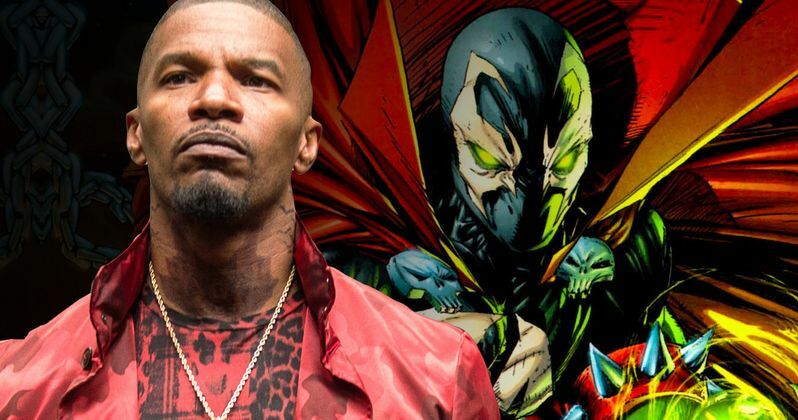 Spawn Reboot Getting Jamie Foxx in Title Role? Jamie Foxx may be heading back to the world of comic book movies, but in a rather different sort of situation. According to a new report, the Oscar-winning actor has been offered the titular role in Blumhouse's Spawn movie. While this report hasn't been confirmed by any official sources, it looks like this project may finally be coming together behind the scenes as casting is underway. Todd McFarlane, who created Spawn in the world of Image Comics, is writing and directing the new Spawn movie for Blumhouse and is currently in the process of casting the central roles. Earlier this year, McFarlane teased some big casting news coming soon and seemed confident he was going to be able to lock down a big name for the role of Al Simmons, aka Spawn. Now, it appears as though an offer may have been made to Jamie Foxx, but he has yet to accept or turn down the role, according to this new report. Foxx stated five years ago that he was interested in playing Spawn, so this would make some sense. So there is reason to believe that Jamie Foxx would be interested in the role, but there are some caveats to this. Todd McFarlane has made it clear that Spawn won't be the main character in this movie. He's been compared to the shark in Jaws and will be a haunting presence lurking in the background. It's also said that Spawn won't actually speak in the movie. Assuming that is still true, it seems hard to believe that an actor like Foxx would want to do something such as that. Then again, maybe they will alter some elements of the script to get him on board. The character of Twitch, one half of the duo Sam and Twitch from the Spawn comics, is going to be the main character in the movie. So not only will the titular character not speak, but he will have to share the screen with another star. Blumhouse will likely try to cast a name for Twitch in order to try and sell the movie to the masses. Not to mention that The Amazing Spider-Man 2, in which Jamie Foxx played Electro, was something of a mess and surely didn't turn out how the actor had hoped when he signed on. Perhaps he would be wary of taking on another role in a comic book movie because of that. Currently, the Spawn remake doesn't have a release date, but 2019 seems likely. We previously reported that production was possibly going to be getting underway, but this new report states that they are now shooting for August, assuming the casting process goes well. Much of that will have to do with whether or not Jamie Foxx says yes. We'll be sure to keep you up to date as new information on the project is made available. This news comes to us courtesy of That Hashtag Show.